UFT.org Home > News > New York Teacher > Feature stories > To their health! Miller PhotographyFruit is the in thing at PS 249 in Brooklyn. With students are (from left) Assistant Principal Kelly Ho, guidance counselor Kathleen Amsterdam, physical education teacher James Horan and teacher Nancy Bochbot. Hundreds of New York City public schoolchildren have been moving their bodies, munching on carrots and discovering the natural sweetness of fruit. 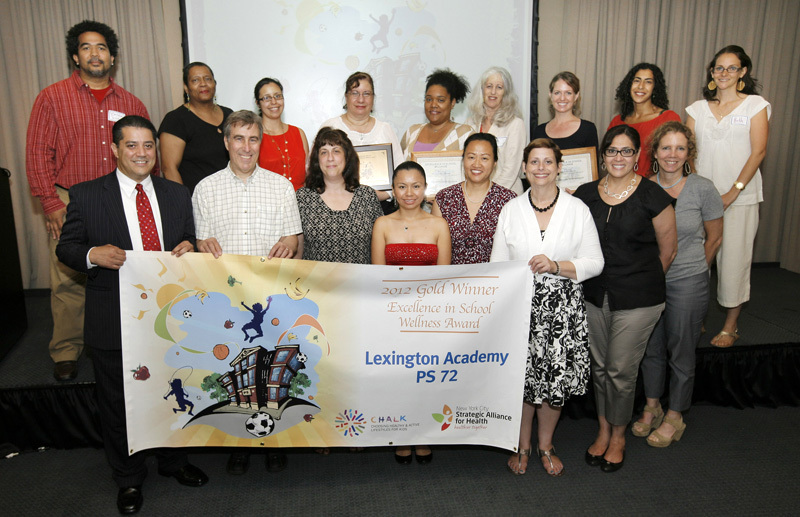 Now they have discovered how good it feels to take home the gold, silver and bronze at the Excellence in School Wellness awards ceremonies that were held on June 14, 19, 20 and 22 in the Bronx, Brooklyn, Queens and Manhattan. “It makes students more aware in general of their health both in and out of school,” said physical education teacher James Horan of the wellness program, which is sponsored by the New York City Strategic Alliance for Health. Miller PhotographyMembers from PS 72 in Manhattan show off their gold award, a banner for outside their school. The participating schools — including PS 249 in Brooklyn, where Horan teaches — are in districts that have the city’s highest rates of obesity, asthma, diabetes and cardiovascular disease. “So learning new habits early is very important for our children,” said UFT Bronx Borough Representative Jose Vargas. Schools are judged by how many of the suggested health initiatives they have implemented, including activities such as power walks, field days, daily health tips to staff and students, parent wellness workshops, the Breakfast in the Classroom program and incorporating physical education into the curriculum. Sadly, however, the health alliance has lost its federal funding, putting the three-year program in jeopardy. Unless it can procure funding from some other entity, it will fall by the wayside just as it has been taking root. 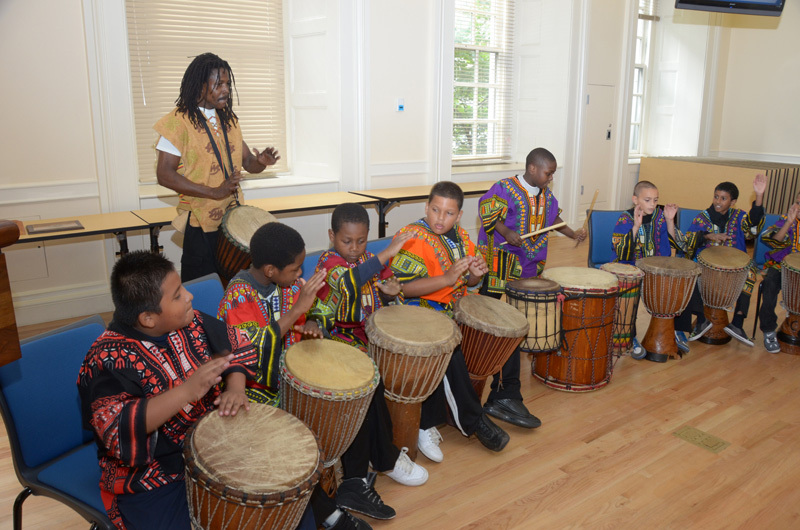 Miller PhotographySpicing up the Brooklyn event are students playing African drums led by instructor Bassanio Clark. But at least the seeds of living well have been planted. Sean Feldman, for example, a physical education teacher at PS 16 in Queens, is advocating forming a wellness committee at his school and investing in more health-oriented activities. Feldman is excited about the progress made at his school, which participated for the first time this year and received an honorable mention. “We are moving forward to meet, on our own, the criteria for the program’s silver and gold awards,” he said. Feldman added that positive peer pressure has taken on a life of its own, such as children reminding each other to make a healthy choice: If you see a Dorito, say something. Gold winners: Bronx Charter School for Excellence, Mott Haven Academy, PS 43, PS 55, PS 61, PS 64, PS 69, PS 85, PS 112, PS/MS 218, PS 385, The Sheridan Academy for Young Leaders. Silver winners: The Family School, PS 72, PS 114, PS 130. Bronze winners: PS 9, PS 36, PS 46, PS/MS 95, PS 140. Honorable mention: PS 28, PS 18, PS 132, The Museum School. Gold winners: Samuel C. Barnes Elementary School, PS 89, PS 86, PS 249. Bronze winners: PS 25, PS 123, PS 345, The Brooklyn Brownstone School, PS 9. Honorable mention: PS 328, PS 159, PS/IS 155, PS 214, Leadership Prep Ocean Hill Charter School, PS/MS 306, PS 41, PS 7, East New York Elementary School of Excellence, PS 3, PS/IS 298, UFT Charter School, PS 290. Gold winners: Central Park East II, Dream Charter School, PS 4, PS 7, PS 57, PS 72, PS 83, PS 102, PS 146, CS 154, PS/MS 161, PS 180, PS 206, PS 334, PS 452. Bronze winners: PS/IS 171, PS 175, PS 210, PS 241. Honorable mention: PS 128, PS 132. Silver winner: PS 48. Honorable mention: PS 30, PS 16. See more photos in the "Excellence in School Wellness Awards" gallery.